I arrived in Houston in November and the atmosphere was heady with the energy of change. Although Republican Ted Cruz managed to beat Beto O’Rourke’s viral Democratic campaign in the Texas Senate elections, blue signs were still strewn across lawns weeks later. It is a heated time politically in a state that may soon become the site of a much-debated border wall – and a city still recovering from the aftermath of Hurricane Harvey in 2017 – yet the atmosphere remains hospitable in the face of debates that we have come to associate with raised hackles and divisive bulwarks elsewhere. Houston’s growing trove of arts spaces is stepping up to meet the urgent topics of climate change, inequality, police brutality and postcolonial legacies with sensitivity and weight by giving artists the space to explore them in public. Recently, for example, the Moody Center for the Arts and the French Embassy presented ‘A Night of Philosophy and Ideas’, featuring eco-philosopher Timothy Morton and multimedia artist Laurie Anderson. The free event included presentations and interventions by scientists, visual artists, dancers, filmmakers and academics reflecting on the Paris Climate Accord and the future of environmental action. It attracted over 1,500 visitors and was met with great enthusiasm. Not the reaction you might first expect in a city built on a still booming oil and gas industry, and in the wake of Trump’s 2017 pledge to leave the Accord. But many locals are not just invested in energy, they are dedicated to directing that energy towards change. They are also acutely aware of the ways Houston’s activities extend into a global network of power, and how national and international agendas become entwined with local lives. Houston is the fourth largest city in the US and its most diverse metropolis. Besides the engineering industry, NASA’s Space Center and the world’s largest medical centre have attracted people from all over the world to help design solutions for the future: new fuel sources, new cures, new galaxies. Experiments in imaging new worlds, such as Japanese artist Momoko Seto’s VR film PLANET ∞, 2017, also on display at the Moody, find fertile ground in this context. In seductively immersive visuals and sound, visitors can undergo the projected invasion of post-human nature through this work. A few days later, the Rothko Chapel and non-profit space DiverseWorks presented an excerpt of dance theatre work Floe by Chicago-based company The Seldoms, which is choreographed around the topic of rising sea levels. The performance sifts through affects of delusion and doubt, referring to actual impacts and climate conspiracies. Avoiding both dystopian and utopian grand narratives, and highlighting the simultaneous fragility and transformative power of the imagination, both projects are enriched by the interdisciplinary connections found here. Houston doesn’t exactly have the contemporary arts pilgrimage kudos of New York or LA, but the pioneer space cowboy metaphor of discovery is a powerful one, if it can be directed towards open and ethical curiosity. Looking at its recent history, in fact, an impressive host of artists, critics, filmmakers and curators spent time in Houston while on their path to shape the canon of ‘Modern’ innovation. Marcel Duchamp, Jean Tinguely, Alfred H Barr Jr, Dorothy Miller, Roberto Matta, Niki de Saint Phalle, LaMonte Young, Claes Oldenburg and Michelangelo Antonioni are just a few on the list. Invited by a handful of collectors, teachers and curators, traces of this history range from a photograph of René Magritte wearing a cowboy hat at a rodeo and Andy Warhol choosing Houston for the premiere of Lonesome Cowboys to former students who can remember film classes by Stan VanderBeek and Roberto Rossellini and world-class collections at both the Museum of Fine Arts and the Menil Collection. Spend a few days here and it isn’t hard to imagine the giddiness of wading into a combination high-tech collider and small-town Western inspiring these cultural legends. Although high-modernist and humanist values on par with Paris and New York may have been the aspiration for early arts patrons, the unique landscapes and associations of this city are what allow it to entertain a more pluralist collection of perspectives. In this sense, the most exciting sights at the recently reopened Menil galleries are not the surrealist, cubist and abstract-expressionist icons, but the well-researched detours. The new Drawing Institute’s inaugural exhibition skirts Jasper Johns’s archetypal Flag paintings to allow for reflective considerations of process, mark-making, experiment, failure, repetition and craft in a series of ‘minor’ works. It also calls up poetic connections to the drafting practices of engineers, architects and musicians that would surely help make the case for universal arts education. One of the works on display is a pastel study for a map based on Buckminster Fuller’s Dymaxion Airocean World Map, which has jagged edges and shows all the Earth’s continents as one nearly continuous landmass. Downtown at the Asia Society Texas Center, a group exhibition of ‘New Cartographies’ also features artistic renderings of geographic navigations. Via fictional, embodied and migrational routes, the ordering force of cartographic science is hacked, leaking cultural and societal displacements. The delicately inked and embroidered creations of Tiffany Chung convey this truth with devastating force: that the imperialist tools of representation can never accurately quantify the precise scale of the environmental and refugee crises we find ourselves in. Visitors will have a hard time disconnecting from the international network of migrant detention centres traced here, with stories of children imprisoned at the border on the daily news; or avoiding the big blue dot signifying the number of deaths caused by environmental disasters looming over the American south-west, with images of Harvey’s destruction still fresh in everyone’s memories. Perhaps it is the aftermath of the hurricane that has opened up an opportunity to explore these topics, but the fact that the dialogue stretches across disparate institutions and spaces leads me to think it is about a deeper sense of community in fragility. At the Contemporary Arts Museum Houston, an extensive and carefully considered group exhibition titled ‘Walls Turned Sideways’, curated by Risa Puleo, platforms artists who address one of the most laden topics in contemporary America: the criminal justice system, mass incarceration and the prison-industrial complex. Sensitively deconstructing polemical positions, the subject is approached through moments where personal lives meet systematic pressure points: instances of profiling, arrest, due process, incarceration and exit (death or re-entry into society). It also reminds patrons that half of the US population have family members who have experienced imprisonment. ‘The Oakland Projects’, documenting a series of performances, installations and events by Suzanne Lacy with Julio Morales and Unique Holland, captures some of the spirit of this show, and the depth of engagement needed to face these societal structures with a genuine commitment to evolve. 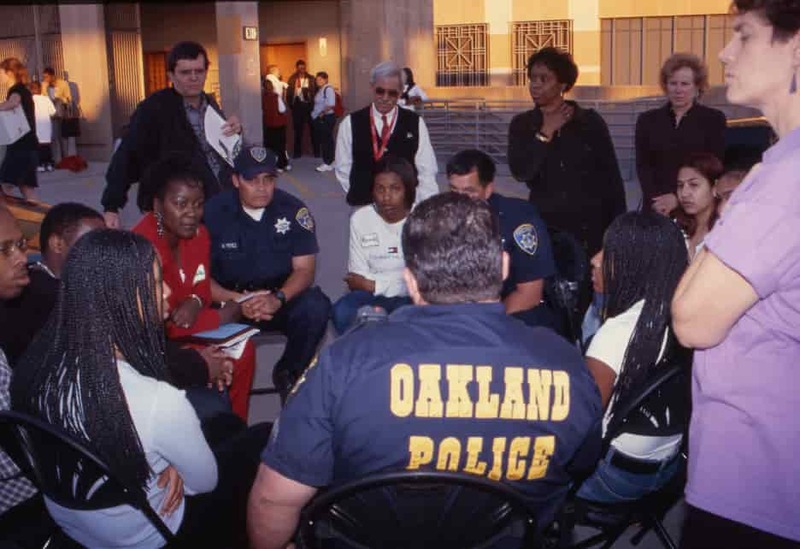 In eight major interventions staged over the course of the 1990s, over 350 young participants frequently subject to profiling were brought together with Oakland officers for conversations, workshops and mentorships that resulted in a police curriculum. A more contemporary work by Autumn Knight, do not leave me, 2013, is a video recording of a performance in which the artist approaches gallery visitors from behind with a handgun in her back pocket. Her simple embrace, an arm on a stranger’s shoulders, carries a powerful mixture of fear, invasion, suspicion, trust, vulnerability and release within the space of a few moments, giving a visceral glimpse into the complex assumptions of safety, protection and equality connected to Open Carry laws in states such as Texas. The strength of these works, and of the show as a whole, lies in their mapping of the emotionally charged entanglements that shape these brief encounters. By risking communication, they encourage us to reconsider the territory we inhabit and how we invest in its reshaping. Hopefully Houston will continue nurturing these much-needed trajectories, not in a quest for resources and control, but in the spirit of unexpected community. Astrid Korporaal is based in Houston and is the research and symposium curator for the Frames of Representation Festival, London. First published in Art Monthly 424: March 2019.